This post is long overdue. The peppers shown here are from my garden in October. As I’ve mentioned before in my garden journals, our bell peppers did amazing this past year and I only hope for that trend to continue. Bell peppers are one of the easiest things to freeze and they are great to keep on hand for soups, stews and sautés. Even if you can’t grow them yourself, you can still stock up when you find them on sale and use the same technique. Step 1: Choose fresh peppers without soft spots or blemishes. Step 2: Wash peppers and slice off the stem ends. Step 3: Remove seeds and pith (the white part) from the inside. Step 3: Cut as you wish (I diced mine, but you could do strips for fajitas or leave them whole for baked peppers). 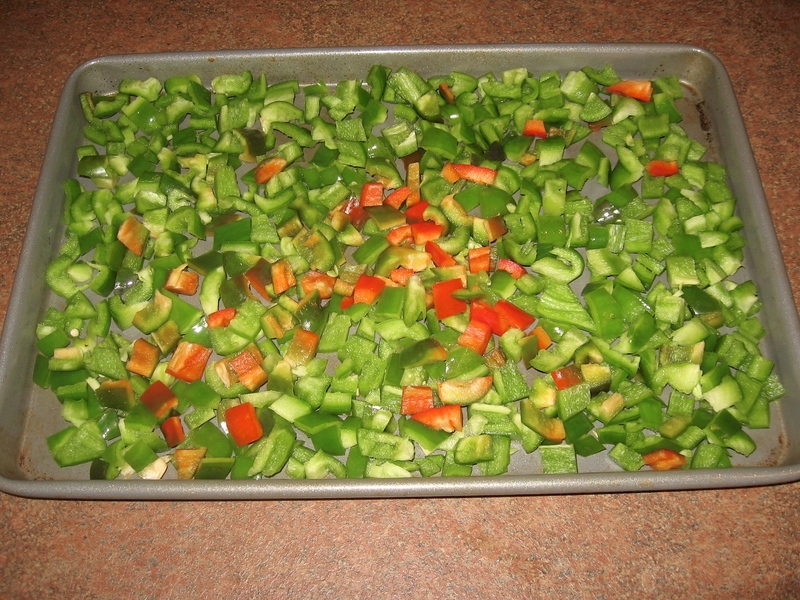 Step 4: Arrange peppers in single layer on tray and flash freeze for 2 hours. Step 5: Remove tray from freezer and place peppers in freezer bag removing as much air as possible. Step 6: Lay flat to freeze and you are done! 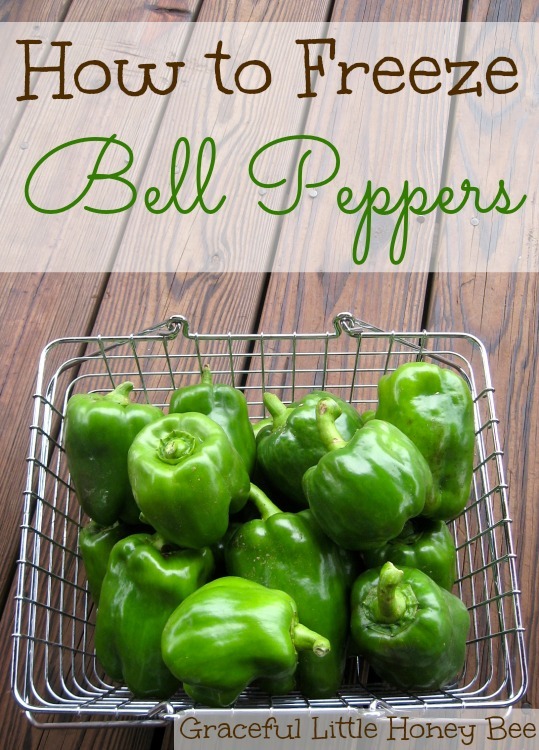 Bell peppers should last 6-12 months in a deep freeze. Whenever a recipe calls for them I just scoop out however much I need and cook them like normal. Writing this is making me want Spring to come even faster! I can’t wait to plant the first seeds of the season. Be sure to check out my Farming & Self-Sufficiency Pinterest Board for more gardening inspiration. Have you ever froze bell peppers? What other fruits or veggies do you keep on hand in the freezer? I’d love to know! Yes, I freeze them all the time....same way you do....they are great to use in chili, meatloaf,when I make spaghetti..... How would you freeze carrots & potatoes ? I have not done this.....do you have to blanche them ? I believe that carrots can be frozen the same as peppers, but potatoes need to be blanched 3-5 minutes. Thanks for this tip. It looks easy and would be nice to have on hand when needed. I'llhave to try it. We freeze strawberries and blueberries when we find them on sale. I love to bake an angel food cake, puree some strawberries and spoon the strawberries over the cake for a delicious low calorie dessert. We use the blueberries for blueberry pancakes, in smoothies and cereal when fresh ones are prohibitive. We freeze hash browns, pumpkin puree, strawberries, green beans, etc. The pickings are getting slim so I know it's almost time to start planting! Our peppers were tiny last year but we buy them at Costco and freeze what we don't use. Do you use them frozen or defrost before using? I like to dice bell peppers and onions and mix them together, put them on a cookie sheet and flash freeze like you said. I use these all year for lots of different dishes. They are so convenient. Great idea. I tried to freeze onions once, but they made my whole freezer smell even though they were double bagged. I was worried that they would make my fruit and freezer jam taste like onions so I ended up throwing them out. Have you had this problem?? I freeze onions and scallions in canning jars or recycled pickle and sauce jars. As long as they have a rubbery seal ring in the lid, the aroma stays in the jar. Thanks for pinning and I can't wait to check out the link party! 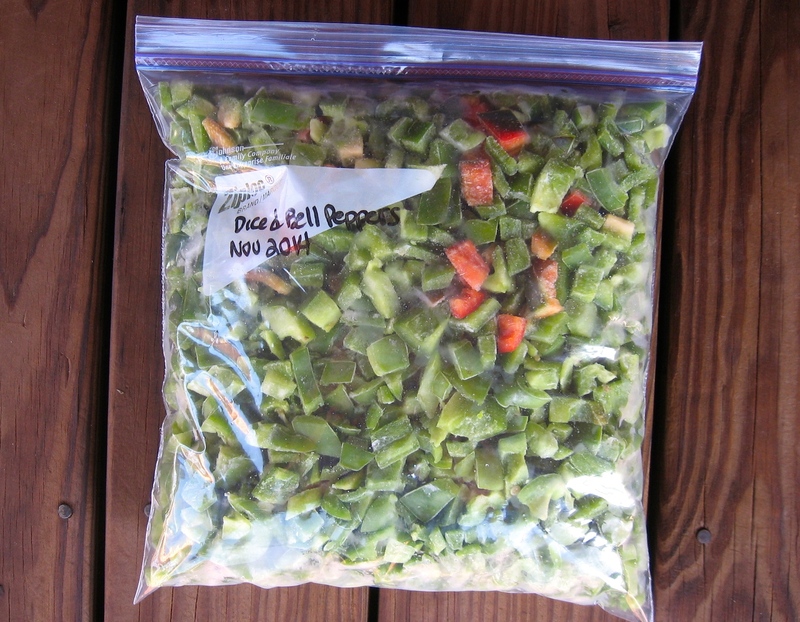 I freeze bell peppers all the time in our freezer meals (and freeze the left over bits for use later when making stocks. Thanks for this, I was just thinking about that! My Meijer had bags of almost-expired green bell peppers, like 6 or 7 per bag, for only $1.50! Next time I see them, I'm definitely buying and freezing them. Sorry. At my age I get confused easily. Please ignore my request to join your site. Thank you. What happens if you don't flash freeze the peppers before vacuum-sealing? They may clump together and become harder to scoop out. Would They still be safe to eat ? Yes, I don't flash freeze them, even though that's a great idea! But I don't have a garden, so I don't do a whole bunch at a time. Whenever I go to use the bell peppers I purchase from the store, I just chop up the rest of them and put in ziploc small baggies in the freezer. If they clump together, I just hit the bag against the counter and they separate. That way they're always ready for gumbo, chicken tortilla soup, enchiladas, spaghetti, chili, or with onions for breakfast with fried eggs. I also chop up onions and do the same thing and haven't been bothered by any smell. I thought you had to blanch bell peppers before freezing. Skipping that step makes it a lot easier. Thanks Missy for the informative post. Can't wait to freeze mine! What do you mean when you say “flash freeze”? Lay in single later on pan and freeze for 1-2 hours. I also do this with onions. And hot peppers. I've successfully frozen diced jalapeño peppers and love them because they don't run to mush when added to soups, chili or tacos. When I tried it with sliced red peppers, they got very soggy when I tried to add them to fajitas. Will flash-freezing keep them a little more crisp? Possibly, but I'm not sure. Sorry.